Knit, knit, knit as fast as you can! Winter is nearly at an end, and it feels like it has only just begun. The season in New Zealand really is far too short in my opinion! In fact, this year, I think Winter happened last week, with the rest of it more like Autumn conditions. I really hope this is not the beginning of generally warmer winters. This week, I was really happy to finally finish my Swan River Cardigan. 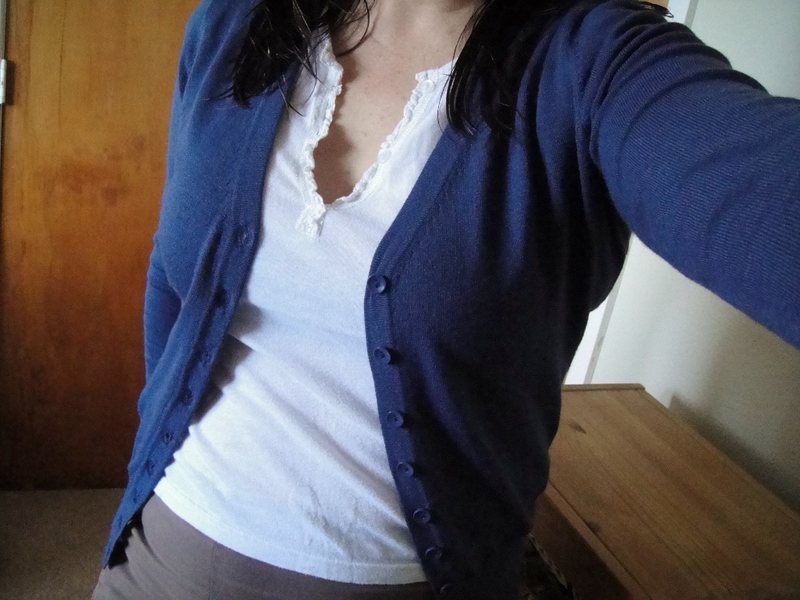 Sorry about the weird poses… I was trying to show the way the cardigan falls at the side! I have never knit one of these very simply constructed cardigans before. 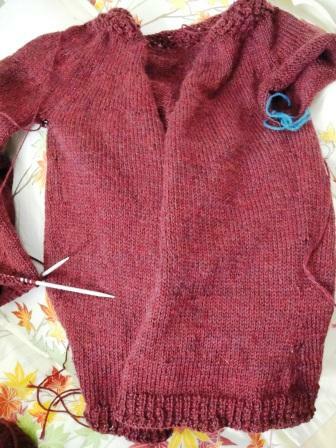 It is essentially knit sideways as a long rectangle with two slits for the armholes, and then you add sleeves. It is as it was designed in the pattern – with drop shoulders which means that the cardigan is quite loose-fitting and definitely a spring/summer or indoor cardigan rather than something for winter outdoors. The only mods I made were to make the sleeves plain, rather than lace. I felt there would be too much lace otherwise. I also added an extra cm of length to the fronts to make them just a bit longer than originally designed. I am totally in love with the yarn. 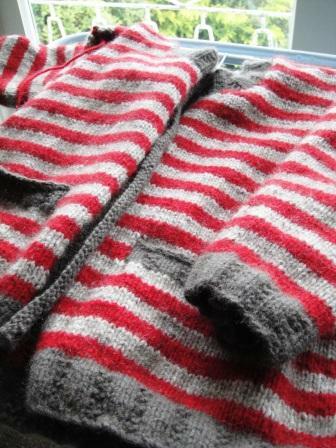 You may recall that this is the Luxury Lambswool 4 ply, dyed as a a one-off special for me from Maniototo Wool. However, the very same yarn is available from Happy-go-knitty as the Hakatere base (you may have to contact her about it or find it at KAN if you are going – it doesn’t appear to be in the Etsy store although I have seen it on Helene’s Instagram feed), and from Ruataniwha Dye Studio (again, best to enquire). I used 390gms of yarn, which amounted to approx 827m/905yds. I highly recommend it! It is incredibly soft, which a beautiful drape and sheen. I am very happy I got a sufficient quantity to make one more thing – a shawl. Last week, I also received some happy mail! Yarn Crush wrote to me and asked if I would be interested in reviewing one of their boxes. As you know, I would never say no to anything knitting related! This cute box contains enough alpaca/cotton yarn to make one of the two enclosed patterns (both a market bag – one crochet, one knit), a very decorative draw string, badges and a notebook. They have quite a unique offering. Each box is different – go have a look at their website to find out more! With Winter fast approaching an end, I thought I had better be nice and knit the young man the balaclava he has his heart set on. Unfortunately, I misread the quantity of yarn required – it needs 200g! And I only ordered one skein… guess it will have to wait to be finished when the yarn arrives. It is very clever – looks like a normal hat, but then you can pull it down over your face and turn into a jack-o-lantern, which the boy loved the idea of! This is also in Maniototo Wool – the Aran Style, in the Matai colourway. Categories: Finished Objects, hats, Review, Wool | Tags: cardigan, FO, Knitting, Maniototo Wool, review, Wool, Yarn Crush | Permalink. I stood in the store and looked at the cardigan. It seemed like the perfect pretty summer cardigan to me. It had a neckline I wanted to check out, the right colour and shape and it was only $30. What could go wrong? I don’t have time to knit everything I want to wear sadly, and this seemed like a nice, lightweight number that I could buy and then concentrate my time on knitting other things that are more suitable for colder weather. I went home and happily put on my new cardigan. The neckline was great – haha! I can now queue the Rosemary Cardigan with confidence to make a winter cardigan of the same shape! A few minutes later, I started to feel strange. Clammy. Sticky. Irritable. What was this? I was most uncomfortable! I took off the cardigan, but started to feel cold. It definitely wasn’t too warm to wear it!? Then I realised: the cardigan was not made from wool. Or cotton. Or any other natural fibre. It didn’t even have viscose or rayon in it. Lulled by the fact that I hadn’t bought any clothing ready made (with the exception of knickers, but you can’t knit them) from a store for over a year, I had fallen prey to a cardigan that was obviously pure synthetic even though it came from a high street shop that normally sells good quality clothing. I had forgotten do to my normal check on the label for some natural fibre content. $30 may not seem a lot of money, but it equates to a fair chunk of yarn. In fact, depending on the yarn I choose, it is almost the cost of a hand knitted New Zealand pure wool/natural fibre cardigan that will not make me sweat, or feel sticky. It will also definitely last a whole lot longer than this piece I have bought, and which already sports several small yarn pulls!! And now, I’m going to have to knit that cardigan I wanted because there isn’t any other way to get it in a cost-effective fashion, or it seems, the quality I need! I feel I should insert this qualifier here just in case I hear “what do you expect from cheap” next: I know this was a cheap cardigan, but I also have at least three expensive pure wool cardigans from designer labels from my richer days, and they are now so full of holes and darned patches as to be unwearable except for gardening and house cleaning. I decided that knitwear had to be knitted by me after that, and that I was not going to pay over $100 for any piece of commercial knitwear given how quickly it wore out. So what am I going to knit? After much pondering on the patterns I’ve admired on Ravelry, and to find the one that most fits what I want, I think it’s going to have to be Tempest. I’ve been looking for a project for this Knitsch yarn for quite a while, and I think I have just found it. I don’t know why I even bother buying ready made knitted clothing these days. Making your own is so much better and more fun. It will just have to take a bit longer before I can have that cardigan! Categories: Knitting, sweaters, yarn | Tags: cardigan, clothing, inspiration, Knitting, natural fibres, New Zealand yarn, Wool | Permalink. This is Pumpkin. The last wee knit I’m doing for the family reunion. This little hoodie is gratifyingly fast to knit. Since I took this photo, I’ve used up that ball you see in the photo, and started another. I’ve been afflicted with an annoying cold/cough thing this week, which hasn’t been conducive to doing fiddly things like sewing seams (excuses, excuses!) Can you see the lovely halo of the possum yarn in this photo? It’s going to be a very warm, cuddly and soft cardigan, and I hope my niece likes it! It’s a nice pattern for possum yarn – it is cropped, quite roomy, and has 3/4 length sleeves, which means plenty of ventilation and comfort for an active child, while keeping her warm at the same time. More on this cardi when I force myself to sew in the sleeves and put in the buttons! We’re in for more wet, horrid weather this weekend. I am hoping this translates into quality knitting time. I am missing the knitting! Categories: Knitting, Possum, Wool, yarn | Tags: cardigan, Knitting, New Zealand yarn, organic merino, possum merino, Treliske Organic, yarn | Permalink. It is a beautiful pattern, and I can see from the look of this WIP that it will turn out just like the pattern. But there is something about this project that sets my teeth on edge. It has sat on my WIP pile for several weeks now, untouched. I only have one sleeve to knit. It’s not even a full-length sleeve. It’s a bare three hours work or so, and it’s done. All I want to do though is rip it out, bury the yarn back in my stash (or perhaps not), and do it again in another yarn. In a yarn I like better, and will feel better about giving away. There are a couple of things I’m unhappy about. The first is the method of increase for the yoke – if you have a look, you’ll see the top-down construction involves increasing evenly across the yoke – but you can see all the increases in those horizontal lines across the yoke. It’s bothering me. I had a look at others’ notes on Ravelry, and some have changed the pattern to make it a raglan sleeve and incorporated the increases that way for this reason. I think I would have preferred to do that – it’s neater. The more significant reason I’m unhappy with this project is that I think I chose the wrong yarn. I keep thinking “crepe yarn” (no pun intended) with this cardigan. 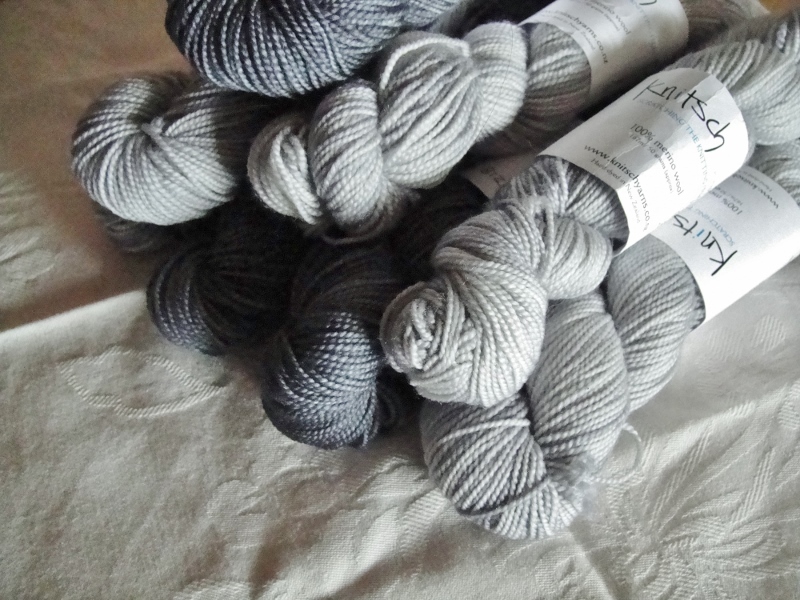 Or perhaps a lovely merino cashmere like Zealana’s Willow. Or something pretty and semi-variegated, maybe something like Madelintosh or Plucky Knitter (from what I’ve heard about it). Maybe even an alpaca yarn. Or possum. All I know is that it needs to be soft, and squooshy, but also durable. 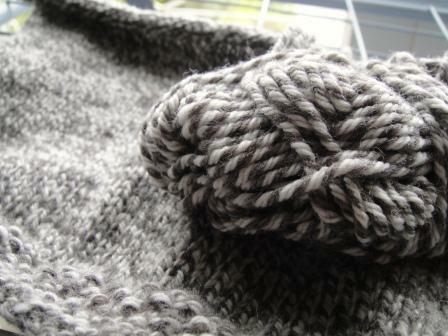 I had awful trouble with the bind-off for the hem – the bind-off ended up being worked three times. The first time, I thought I’d do a proper stretchy bind-off for once. Oooh. Yuck. The hem flared like a peplum, and I knew there was no way on the planet the yarn would block down. Rip. Rip. Rip. The second try, I decided to do my half-stretchy bind-off. It looked lovely, but it was too tight, and the cardigan would not meet in the middle. Hmm. Rip. Rip. Rip. The third try, I decided to do a variation of the stretchy bind-off, and make it a lacy one. I have no idea if this is a ‘proper’ method – “someone” was hogging the laptop at the time, and I was too impatient to wait to look up techniques. I’m reasonably happy with the lacy stretchy bind-off. It goes something like this: Purl one, *YO, Purl one. Purl the last stitch and the YO together through the back loop, then bind the remaining stitch over it*. Repeat * to * to end. I purled the bind-off because it caused the bind-off edging to face inwards and you can’t see that tell-tale “hand knit” ugly row of bind-off stitches at the bottom. It also stretches just right! It looks a little bulky in the photo, but stretched out, it’s fine. Then the lace edge of the sleeve decided to be uncooperative on the final row, and despite my efforts to fix it, I ended up ripping back all 12 rows of the lace repeat. I still haven’t found the quiet space and energy level I need to re-attempt this. I really do not like knitting lace. It is gorgeous when it works out, but I must have too many things whirling around in my head to concentrate properly, because I make mistakes, and then it all turns to custard. Perhaps I’m just not a natural lace knitter. Cables, gansey patterns, colourwork, it’s all good. But get me further than a basic lace edging, eyelet or feather and fan, and I struggle. I find it painful to look at all the patterns for lace shawls that are so popular on Ravelry right now – they give me nightmares thinking about knitting them! I suspect I would enjoy the knitting a lot better if I was enjoying the yarn. After all, knitting is as much about enjoying the tactile experience of yarn in hand as seeing the finished product. So, what do you think I should do? Grit my teeth and finish the last sleeve? Or just frog it and start all over again? I suspect it’s a frog. I don’t think I could proudly give this cardi away. After all, it’s meant to be a birthday present, and how can I do that if it is not satisfactory in my own eyes? Categories: Knitting | Tags: cardigan, Gemma, Knitting, yarn | Permalink. I thought I’d talk about the book I’m taking quite a few of these patterns from – Special Family Knits by Debbie Bliss. I don’t think there is any other book or magazine on my bookshelf that I have knitted so much from! I first knitted Hooded Guernsey from it. Eric has long outgrown his jumper, but I think every now and again that I should knit him another. It was a nice pattern. The little fair isle cardi I’ve just finished also came from this book. There are quite a few other patterns I think that I will eventually get around to knitting from Special Family Knits, including the Rib and Cable Cardigan (for me). You could say it was a very good buy! 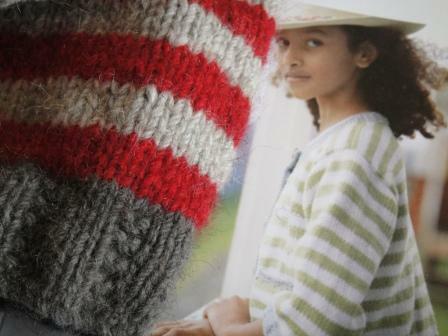 Back to the Striped Cardi, I’m knitting this in a lovely soft merino possum yarn. I’m deliberately keeping it cropped (like in the photo) because my niece lives in a part of New Zealand where it doesn’t get very cold. She’ll like the warmth of possum, but it will be good for her to have a bit of ‘ventilation’, as the cardigan might be a bit too warm otherwise. Hopefully I’ll have more to show you soon. Categories: Knitting, Possum | Tags: cardigan, Debbie Bliss, Knitting, possum merino, possum yarn, stripes, The Wool Co. | Permalink.